Below you will find a list of discussions in the Galaxy Nexus Carriers forums at the Galaxy Nexus Forum - Samsung Galaxy Nexus Community. 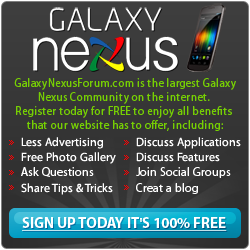 The Galaxy Nexus Carriers forum is for discussion of: . Bell Discussions. Got questions about the Galaxy Nexus on Bell? This is the place to post! Sprint Discussions. Got questions about the Galaxy Nexus on Sprint? This is the place to post! Verizon Discussions. Got questions about the Galaxy Nexus on Verizon Wireless? This is the place to post! Videotron Discussions. Got questions about the Galaxy Nexus on Videotron? This is the place to post! Virgin Mobile Discussions. Got questions about the Galaxy Nexus on Virgin Mobile? This is the place to post! Vodafone Discussions. Got questions about the Galaxy Nexus on Vodafone? This is the place to post!